Daily and frequent Eurostar, Thalys and TGVs trains to Bourg-St-Maurice. On Saturday 18th March, there is a direct Eurostar train leaving London at (tba) and arriving in Bourg-Saint-Maurice at (tba). On Saturday 25th March, there is a direct Eurostar train leaving Bourg-Saint-Maurice at (tba) and ariving in London at (tba). Transfer from Bourg-Saint-Maurice train station to the resort with our exclusive European Snow Pride transfer service or with other companies independent of our organisation. 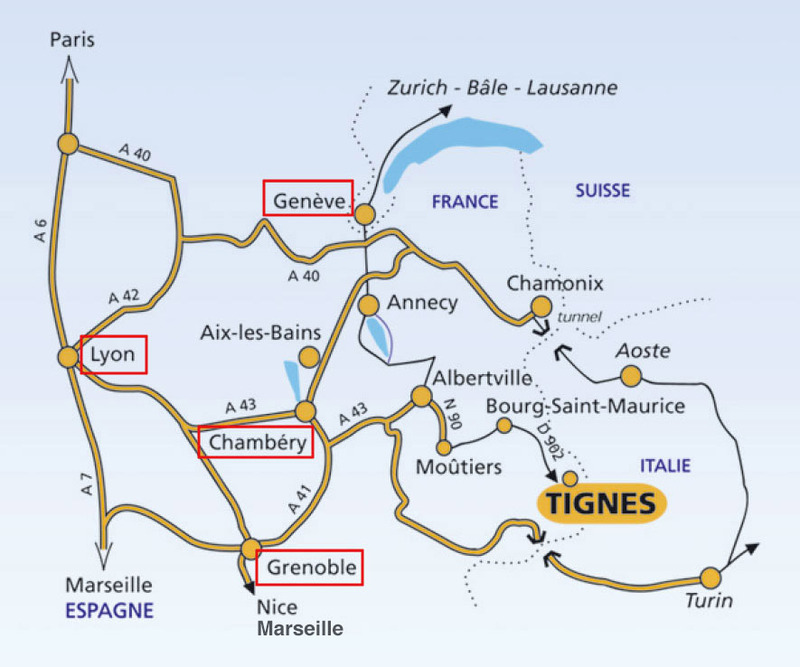 Geneva Cointrin, Lyon Saint-Exupéry, Grenoble Saint-Geoirs and Chambéry are the closest international airports to Tignes. For the companies and flights available from these airports click on the links below. Transfer from Geneva Cointrin to the resort with our exclusive European Snow Pride transfer service or with other companies independent of our organisation. Transfer from the other airports to the resort with other companies independent of our organisation. A430 Chambéry – Albertville, dual carriage way until Moûtiers, N90 until Bourg-St-Maurice, D902 until Tignes. Warning ! Do not follow your GPS instructions if it advise you to go through the Petit Saint Bernard or the Iseran pass as those passes are closed during winter ! Alternatively you can also book your parking space at your selected accommodation if there is a car park available at your residence/hotel (please check the P sign on top of the residence/hotel description page on our web site). We strongly recommend that you reserve your parking space in advance, either in the ‘Golf’ car park or the car park of your residence/hotel when making your reservation. If you wish to book a parking space at your residence/hotel (only for the résidences or hotels offered on our web site) instead of the ‘Golf’ covered car park, please email us in advance and we will let you know how to proceed. There is also one free car park available in les Tignes les Brévieres (5 km away from Val Claret). From this car park there is a free shuttle bus running every 30 minutes that will bring you to Val Claret.